DAYTONA BEACH, Fla. (April 8, 2019) – Series officials proudly announced today that The Cat Rental Store has been named the Official Heavy Equipment Provider of American Flat Track. The strategic partnership between AFT and The Cat Rental Store comes at a pivotal time of growth for the sport. A combined global network of more than 1,400 dealer-owned locations makes The Cat Rental Store a convenient source for Cat® and allied equipment and specialized tools to meet most job site needs. Caterpillar is a global leader in heavy equipment manufacturing, and the Deerfield, Ill.-based company has provided solutions for infrastructure development for nearly a century. 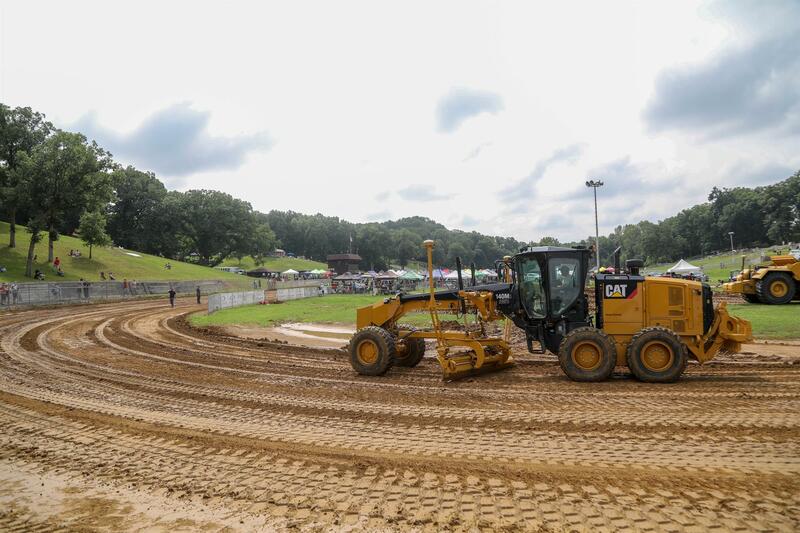 Just prior to the 2018 edition of the Peoria TT, a deluge left the circuit unrideable, and it looked like American Flat Track’s longest-running race would be canceled. When faced with extreme circumstances, Caterpillar’s Edwards Demonstration & Learning Center operators delivered. The operators stepped in and resurfaced the entire race track overnight. The experience of their operators, combined with their world-class heavy equipment, rescued an event on the brink of cancellation. The Cat Rental Store network offers the largest construction equipment rental fleet in the world. At each race, American Flat Track will have access to the full spectrum of the Caterpillar product line, from the company’s well-known Cat earthmoving machines, excavators, skid steer loaders, backhoes, pavers and compactors, work tools and power generators to more than 60 other top-tier brands for aerial work platforms, compressors, concrete, HVAC or dumpers. In addition to being the global leader in heavy equipment, Caterpillar also offers power and temperature solutions for some of the largest events and entertainment industries in the country via the Cat® Entertainment Services network. For more information on The Cat Rental Store visit www.catrentalstore.com. The 2019 season continues on April 20 with the Al Lamb’s Dallas Honda Texas Half-Mile presented by Russ Brown Motorcycle Attorneys at Texas Motor Speedway. Watch as AFT Twins and Roof Systems presented by Russ Brown Motorcycle Attorneys AFT Singles competitors bang bars in the hunt for the championship. Do not miss the premiere of the AFT Production Twins class at this iconic racetrack in the heartland of Texas. Tickets available now at www.americanflattrack.com. For more than 90 years, Caterpillar Inc. has been making sustainable progress possible and driving positive change on every continent. Customers turn to Caterpillar to help them develop infrastructure, energy and natural resource assets. With 2017 sales and revenues of $45.462 billion, Caterpillar is the world’s leading manufacturer of construction and mining equipment, diesel and natural gas engines, industrial gas turbines and diesel-electric locomotives. The company principally operates through its three primary segments – Construction Industries, Resource Industries and Energy & Transportation – and also provides financing and related services through its Financial Products segment.